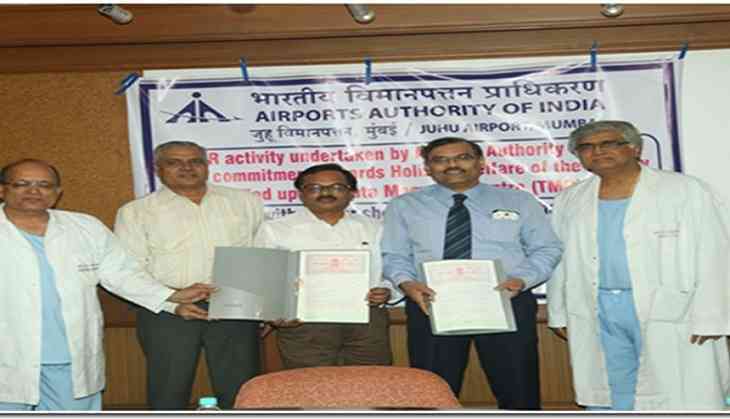 As part of the Corporate Social Responsibility (CSR), the Juhu Airport of the Airports Authority of India (AAI) signed an MoU with the Tata Memorial Hospital (TMC), Mumbai, and has given Rs. 1.32 crore as a financial aid towards the procurement of specialised equipment needed for treatment of destitute children suffering from cancer. • Provision of Rs. 1 Crore for complete financial adoption of underprivileged children suffering from cancer at Tata Memorial Centre (TMC). The total cost of treating one child with Cancer varies from Rs. 50,000/- (Rs. Fifty thousand) to Rs. 4,00,000/- (Rs. Four lakh). The average cost of therapy per child is Rs. 2,00,000/- (Rs. Two lakh). Accordingly, the fund shall be utilized for treatment of destitute children in need suffering from Cancer. The prognosis of the disease and patients shall be provided by Tata Memorial Centre (TMC), Mumbai to AAI to adopt the child for financial assistance by Airports Authority of India (AAI). The help of Airports Authority of India (AAI) shall provide great relief to the needy children suffering from such a dreaded disease. An emergency fund of Rs. 5,00,000/- (Rs. Five lakh) has also been provided by Airports Authority of India (AAI) for imparting treatment to the underprivileged child diagnosed with cancer in initial phase in need of urgent funds. • Rs. 31.38 Lakh for procurement of Tape Station High-throughput Machine for the Department of Med-Oncology-Molecular Laboratory, TMC, Mumbai. Tape Station High-throughput Machine will help to check DNA/RNA quality which is required at multiple steps during the processing of the material for doing the Next Generation Sequencing (NGS) to make a proper diagnosis of Cancer and to enable doctors to give "Targeted Therapies" in this era of "Precision Medicine". The MoU for the above CSR project was signed by Dr. M.K. Bimal, Airport Director, AAI, Juhu Airport, Mumbai and Dr. Shripad D. Banavali, Professor and Head, Department of Medical & Paediatric Oncology, TMC in the gracious presence of Shri Keshav Sharma, Regional Executive Director, WR, AAI, Mumbai; Dr. Rajan Badwe, Director, TMC and Prof. K.S. Sharma, Director Academics, TMC and other officials of AAI and TMC. AAI assured that the aid from AAI shall continue for this noble cause. As a gesture of affection to spread happiness, AAI officials also distributed small packets of fruits juice, chocolates and dry fruits etc. among children admitted at TMC. "Out of the total amount we received, around Rs. 1 Crore will be used to finance treatment of 50 children a year," said Dr. Sripad Banavali, TMC's Head, Medical Oncology. Keshav Sharma, Regional Executive Director (Western Region), AAI said, "We feel humbled to have been able to provide assistance for a noble cause that touches humanity, we will continue to provide our support for the underprivileged children in the coming future too." Speaking after signing the MoU, Dr. M.K. Bimal, Airport Director, Juhu Airport, said, "The MOU signed by AAI with Tata Memorial Centre is going to be of great help for the underprivileged children. This project of AAI shall be a lifeline to destitute children suffering from Cancer. It is part of AAI's commitment towards ensuring holistic health of people of our society. The emergency fund shall save the life of children in need in initial phase of cancer treatment. I'm grateful to AAI for giving us an opportunity to be part of such a noble cause." This is not the only instance of AAI providing assistance towards ensuring timely treatment to underprivileged Cancer patients. Earlier this year, AAI had decided to upgrade the pathology division of Cachar Cancer Hospital & Research Center, Silchar, Assam. The Cancer Hospital provides very low cost services to underprivileged low income population hailing from Barak Valley and Dima Hasao district of Assam, the neighbouring north eastern states like Tripura, Manipur, Meghalaya and Mizoram. Airport Authority is providing a financial assistant of Rs. 76.05 Lakhs. Commenting on AAI's thrust on providing assistance towards ensuring better medical facilities to the underprivileged, Dr. Guruprasad Mohapatra said, "As a successful PSU, we feel morally responsible towards doing our bit in ensuring holistic lifestyle for the less privileged in our society. Our initiatives in the Northeast India, Cochlear implant assistance in association with ALIMCO, cervical screening programme for the less privileged women and now with Tata Memorial Hospital are testimony to our commitment to the cause."